The 2015 Santa Barbara Kite Festival Celebrates 30 Years! 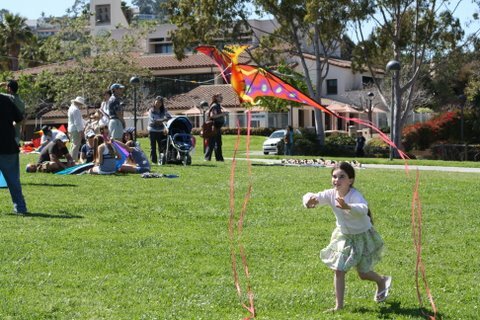 The 30th Anniversary edition of the Santa Barbara Kite Festival will take to the skies Sunday April 12th, 2015 from 11am-4pm in the “Great Meadow”- west campus lawn at Santa Barbara City College. This fun-filled family-style kite flying festival is celebrating 30 years as one of the community’s favorite festivals. The 30th Anniversary Santa Barbara Kite Festival will spotlight handmade kites, from the creations of local children to handmade kites featuring amazing cutting edge flying technologies, designs and fabrics. Over the past 30 years, the festival has been the lucky witness to hundreds of beautiful handmade kites. Organizers will recognize handmade kites again in the festival’s 2015 edition of the “Most Beautiful Kite” competition. Commercially-made kites are also welcome in the competition and will be available for purchase at the festival. In addition to the “Most Beautiful Handmade Kite” competition, the festival will feature the “Kite Tail Chase” game for children throughout the day. Children, divided into appropriate age groups, try to catch the tail of a kite flown by the festival’s kite master Rakesh Bahadur, as the kite dips and dives through the air. Other competitions include “kite fighting” and “sport flying” for skilled flyers, “highest flying”, and “largest kites”. Kites will be available for purchase at the festival. There will also be food and beverages, and a kid’s zone with a jumper and family info tables. The festival is free and open to flyers of all abilities. Paid parking is plentiful on campus. More festival information and updates are available at http://www.sbkitefest.net , the festival’s Facebook page, or by emailing davidhefferman@hotmail.com, 805-637-6202. The “Great Meadow” (west campus lawn) is located on Santa Barbara City College’s West Campus at 971 Cliff Drive in Santa Barbara, adjacent to the college’s main campus. April 2015 is Kite month in Santa Barbara. Thanks to a 2007 proclamation by the city’s honorable Mayor Marty Blum and the Santa Barbara City Council, the month of April is officially designated as Kite Month in the city of Santa Barbara. In addition, the Santa Barbara Kite Festival was recognized in 2007 for its annual contributions to community recreation and family fun. Mayor Marty Blum agreed to author the proclamation in coordination with National Kite Month – a not-for profit venture co-founded by the American Kite Flyers Association and the Kite Trade Association International . For info, log on to http://www.nationalkitemonth.org .